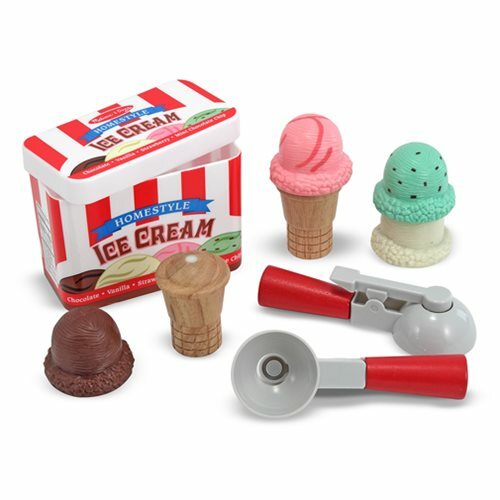 Use both the magnetic scoopers, four scoops of favorite ice cream flavors, and wooden cones in this Scoop and Stack Ice Cream Cone Playset for hours of positive social interaction and fine motor play! The ice cream scoops store neatly in the sturdy plastic container. Ages 3 and up. For a child, the only thing more delicious than an ice cream dessert might be the chance to be the one in charge of it! Perfect for preschoolers longing to act out real world scenarios and assert some control over their lives (and irresistible to older kids, too! ), this wooden playset allows kids to choose how many scoops, what flavors, and is it time for seconds yet? Imagining themselves on the other side of the counter, busy scoopers will naturally exercise communication skills, hand-eye coordination, sorting, counting, memory, and sequencing as their confidence and social skills grow.